The Gardiner-based battalion got an official Freedom Salute ceremony in Lewiston Sunday. The Denmark, Maine, resident said he was thrilled to get home to his 15-month-old son and glad to eat pizza again. “But I was used to being in charge and now my wife is,” said Allen. 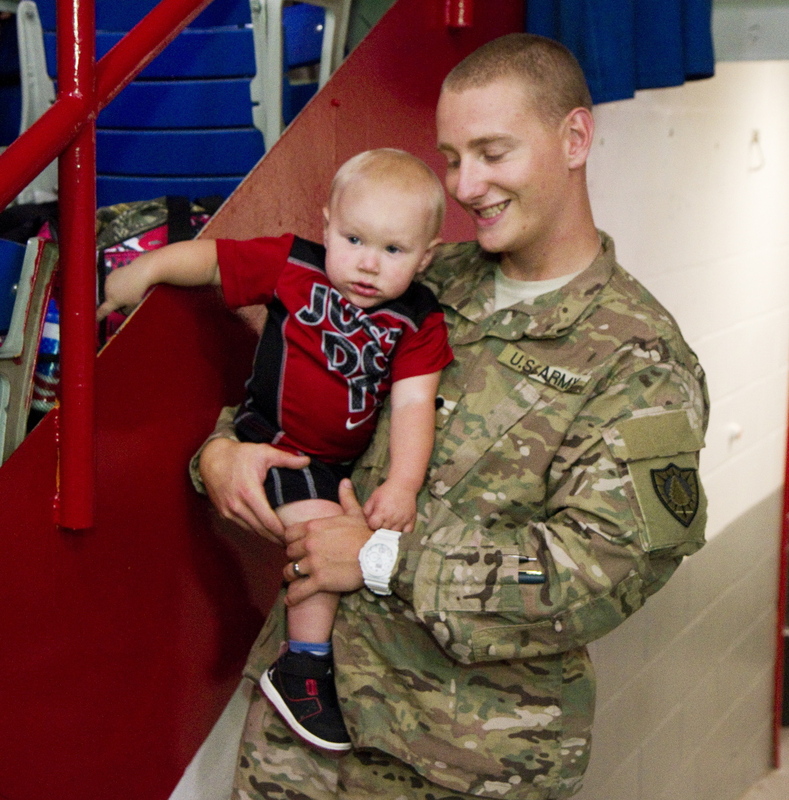 Allen was among a crowd of 180 soldiers from the Gardiner-based Maine Army National Guard’s 133rd Engineer Battalion and 1035th Survey Design Team who were welcomed back at an official Freedom Salute ceremony Sunday at the Androscoggin Bank Colisee. The ceremony is a military tradition and designed to help the soldiers, who returned to Maine several weeks ago, reintegrate into civilian life. Surrounded by families and friends, the soldiers received praise from Gov. 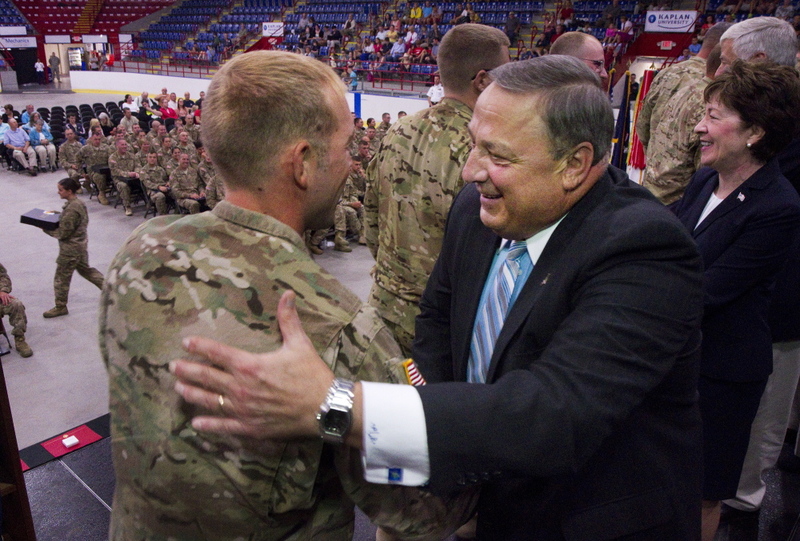 Paul LePage and members of Maine’s congressional delegation for their accomplishments providing operational guidance and support to a battalion of six engineer companies from October through June. Each soldier’s name was called off as they made their way through a line of handshaking officials to receive plaques, rings and other commemorative objects. The combat engineers, who are trained in battlefield and peacetime construction techniques, were responsible for helping to wind down the war in Afghanistan, dismantling bases and moving heavy equipment in an area the size of Oklahoma and Texas. The 133rd served as the central command for materiel recovery. They demilitarized 1,650 structures, removed 364,000 yards of gravel and 2 miles of concrete barriers and demolished 15 guard towers. The 1035th provided engineer surveys of job sites and detailed drawings for missions. They also helped with construction at Bagram Air Field, the largest U.S. military base in Afghanistan. The soldiers’ families also received praise for keeping the home fires burning. “The families are truly by their sides all the time,” said LePage. Family members said the ceremony was a way to recognize everyone’s efforts. The family of Capt. Stephen Spearin of Appleton, who took up most of one row of seats, said they were grateful for all the support the family received while he was away. “They prepared us very well for his return. He is doing really well,” said Spearin’s mother, Cindy Spearin of Appleton. The 133rd was deployed to Iraq in 2004-2005 during the height of the war and lost three soldiers. The unit was also the focus of headlines in the spring when a plan surfaced by high-level Guard officials to trade the 133rd to Pennsylvania in exchange for an infantry battalion as part of a larger U.S. military restructuring. Former Maine Guard leaders came out against the move while LePage and Brig. Gen. James Campbell, adjutant general for the Maine Guard, insisted no final decision would be made for years and any decisions would be made by Congress. There was no reference to the controversy during the ceremony Sunday, but several returning soldiers said they were aware of it while deployed in Afghanistan. Staff Sgt. Charles Townsend of Limington, who is back at his job at Hillside Lumber in Westbrook, said Maine would be better served by engineers than infantry. But Townsend said he understands that the world has to change. “This would not be the first time this unit has changed,” he said. Sgt. 1st Class Kim Purington of Poland, who managed to plan her Sept. 27 wedding while in Afghanistan, said she wants the 133rd to stay in Maine. “It is my whole career. I love it,” said Purington.